War is a terrible business. The violent nature of the tools used in combat – guns, bombs, explosions, fire – can do dreadful things to human bodies. In the course of this sort of research, you sometimes come across some shocking stories. A P-47 Thunderbolt pilot, for example, was killed in a crash in eastern Holland in November 1943. A young girl found a loose boot belonging to the pilot near the wreck of the aeroplane… with a foot still inside. Or the unfortunate Charlie Nash, a 467 Sqn mid-upper gunner who was killed on the 10 May 1944 Lille raid. Such was the force of the explosion that brought his Lancaster down that Nash was dismembered. He was initially buried in two distinct graves, one in Hellemmes and one in Forest sur Marque. Many of these sorts of stories are revealed in the files of the Missing Research and Enquiry Service, a team of RAF investigators who combed what had been occupied Europe to establish the fate of as many missing airmen as possible after the liberation of each area. The reports can sometimes make for disturbing reading. So much so, in fact, that full MRES reports are not released to the public in the UK if authorities believe they will be too distressing for next-of-kin or other researchers to read. There is no doubt that these reports can contain some very grisly details. But factual reports of this nature are just that – factual. The details contained within them are very real. The events they deal with really happened – to real people. How much should modern-day sensibilities take precedence over knowing the truth? This is an extremely difficult question to answer, and it’s one that every researcher must give serious thought to. There are two conflicting priorities here: the natural desire of the historian to tell the truth, the whole truth, and nothing but the truth, versus the need to protect families from some pretty disturbing feelings about what might have happened to their relative. It is sometimes easier for the researcher to deal with these sorts of unpleasant revelations if they have no direct family connection to their subject. What they need to be careful of, however, is the sensitivities of those who do have that direct connection. I’ve been guilty of this myself, once or twice blithely telling a story to a relative of one of my great uncle’s crew without first considering how they might take the news. It’s only after I’d finished, when I saw their reaction that I realised, whoops, perhaps I could have dealt with that one with a little more sensitivity. Ultimately, it is the researchers themselves who are responsible for making this very difficult decision. I disagree with the authorities determining what will and will not be released because I think it should be the duty of the researcher to decide what they do and don’t tell their audience. Researchers must be sensitive about how they communicate these sorts of stories. Personally, I tend to prefer the truth, warts and all. After all, this is what actually happened. But I need to be very careful about how I get the message across. The internet has made it a lot easier in recent years to make connections between people sharing common interests. One comment I received on this blog in recent times led to me linking up two people with an association with the same aircraft (ME739 of 630 Sqn): one whose great uncle flew it at the beginning of its career in April 1944 and one whose neighbour was shot down in it on its last operation exactly a year later. I’ve also had a comment from an artist preparing an entry for the 2012 RAAF Heritage Prize. And I received a comment a few months back from James Hollinworth, who has been researching Tamworth’s aviation history for some time. He was able to add significantly to what I now know about Andrew MacArthur-Onslow, the man with whom Gilbert Pate first tasted flight in the last few days of peace in 1939. Given MacArthur-Onslow had held a pilot’s licence before the war (he had to have one if he had taken Gilbert with him!) I knew he already had some sort of flying experience. But I had no idea of just how much. James says he was an aerial surveyor prior to his enlistment, and as early as 1936 had visited Tamworth for the Diamond Jubilee Air Pageant that was held there, flying one of six machines from the Royal Aero Club. He enlisted in the RAAF in January 1937. But for me, the most staggering fact that James has revealed is that, in 1938, Andrew MacArthur-Onslow, along with his brother Denzil, flew their own aircraft from England to Australia. Even today this is no mean feat, let alone in the 1930s. I did have a look through Phil’s logbook for his time at Tamworth (November and December 1940) but MacArthur-Onslow’s name does not appear in it so the two did not fly together. MacArthur-Onslow, James tells me, remained at Tamworth when 6 EFTS was disbanded in March 1942. The unit was replaced by the Central Flying School, which had the task of training the Air Force’s future instructor pilots. It was in this capacity that Flight Lieutenant Andrew William MacArthur-Onslow was flying with Sgt Thomas Myles Dawson on 18 January 1943 when, two and a half miles south west of Currabubula – about thirty kilometres south west of Tamworth– the Wirraway they were flying crashed while on a low flying exercise. 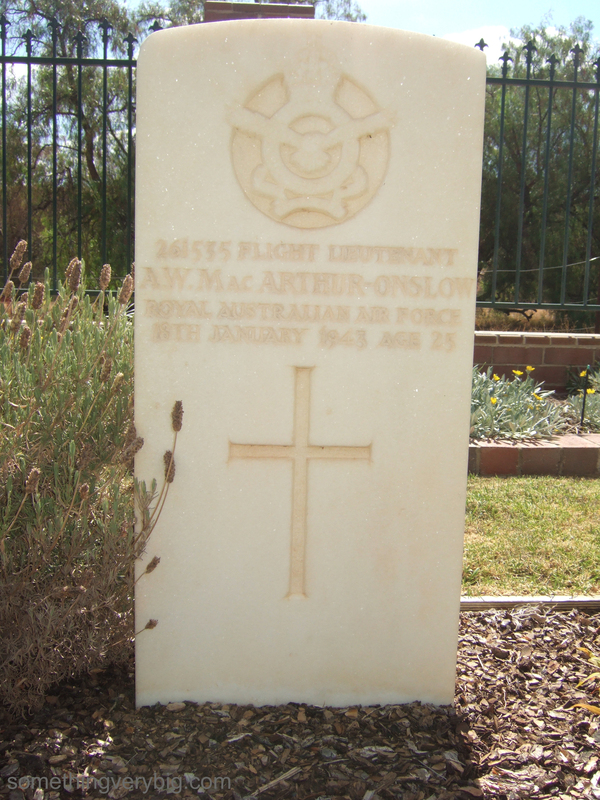 Along with his unfortunate student, MacArthur-Onslow was killed and is buried in Tamworth War Cemetery. Thanks to James Hollinworth for the information that went into this post and the photograph of the grave. My ultimate aim with this research is to write a significant piece of work – a book – to tell the story of the crew of B for Baker, who they were, where they came from and what part they played in the overall context of the bomber offensive. Much of this blog has been about the actual research that I’ve completed in this project. But I haven’t looked much at that important second bit – the writing thing. And that’s probably the bit that I need most practice in. What follows, then, is a basic framework for how I approach writing a short piece. It will need to be developed when I get around to writing the book that I’d like to end up with, because that will probably end up significantly longer than anything I’ve written before, but it’s a place to start from. This is, in broad terms, the process I use. My writing evolves through a number of distinct phases. First comes the research part, where I find sources, take notes and build up a picture in my mind of what actually happened. Only when I think I have enough information to have the bare bones of a story in my head do I actually start to write. The second draft is where the structure gets fixed up. This is where I shift passages around into a more logical, flowing sequence – even if the language used at this point is far from flowing. A clear introduction, body and conclusion develops (evidently Year 12 English taught me something!). I’m still not too worried about length or efficiency of phrase. The third phase of my writing is where I start getting creative. The emphasis to this point has been in getting the story right. From here, however, I’ve got the story itself organised. How the story is told is what concerns me next. If writing to a tight word limit, this is where the culling begins. Irrelevant bits get cut and long-winded passages get shortened. Awkward passages get re-written into more efficient language. Parts get condensed or lengthened if further emphasis is required. By this stage, the main work is just about done. Phase four – the edit – can now begin. I give the piece the once-over myself, checking spelling, grammar, formatting and references. Then I call in outside help – and it’s amazing what another pair of eyes will spot. My sister and mother provided their ‘red pen’ services for Bomber Command: Failed to Return. The revised draft gets revised again, and again, and sometimes again. At this point it’s not unusual to go back to phase three to re-jig phrases or keep culling if I’m really pushing a word limit. Spelling and grammar are given a last check and references are checked for consistency and formatted correctly. Then, at last, the piece is ready to be submitted.